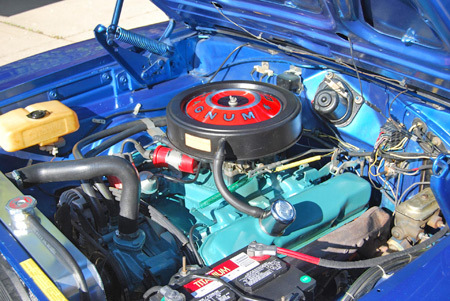 If you work slowly and carefully, you can do a nice job of detailing your collector car's engine without removing it from the vehicle. Detailing involves cleaning the engine, painting it, renewing stickers and decals and giving things like belts and hoses a looks-like-new appearance. Does the engine compartment in your car look like this undetailed Charger 383? To detail an engine in a car, you need light. You must be able to see the parts that are greasy and dirty in order to clean them. You have to know what you're going to paint before you start spraying. Use a flashlight or a trouble lamp to take a good look. When using a trouble lamp, be certain there are no fuel leaks. A shop in this area recently burned when a trouble light ignited leaking gas. When working around carburetors, a flashlight will provide the safest light. Before you can paint an engine, you have to remove as much grease as possible. Paint won't stick to greasy surfaces. Steam cleaning is an excellent way to clean an engine. If you lack a steamer, you can use a spray-on cleaner. Some of these are soapy solutions that you spray on, let sit and then wash off with a garden hose. Others are grease cutters that you spray on and wipe off with a rag. Wear safety goggles and rubber gloves when working with any chemical spray. 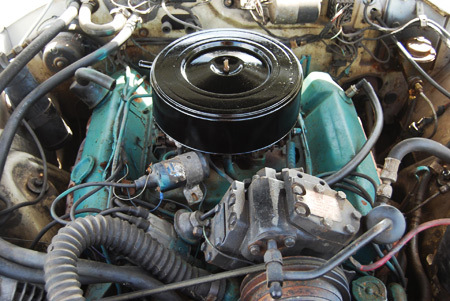 Here's a 383-cid Charger engine that's had some careful in-the-car detailing. A collection of brushes is handy for cleaning hard-to-reach areas. I keep mine in a tackle box. They include old toothbrushes, steel brushes of various shapes, a toilet bowl brush, scrub brushes, paint brushes, a barbeque grille brushï¿½even a $10 gun cleaning kit with long metal brushes that I can chuck in a drill. Brushes can get cleaning solutions into spots where hands won't fit. Compressed air is a big help. It can be used to blow dirt out of nicks and crannies. Always wear goggles when blowing dirt out with compressed air. 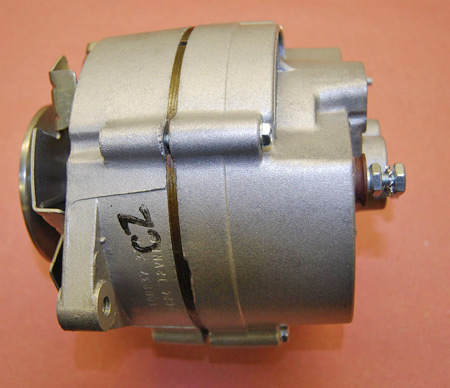 I use a small 2-hp compressor that cost under $100 on sale. It does not run very long, but it still helps me clean engines much better than I could before. 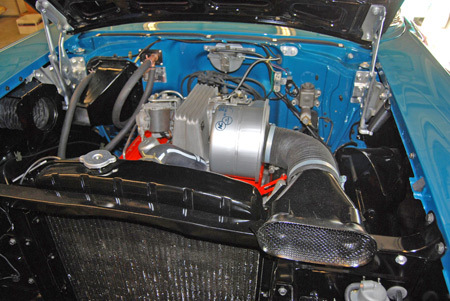 Special thin radiator paint helped this '57 Chevy 'fuelie's' engine bay to shine. To do a really nice job of cleaning an engine, you may want to remove the generator, starter, carburetor, exhaust manifold and air cleaner. How far you take things apart depends on your technical skills, but always remove the air cleaner. You can't do a good job of painting an engine with the air cleaner in place. Spark plugs should be removed and replaced with old ones that you can get over-spray on. Save the good ones, of course. You'll have to re-install them later. Plug wires can be removed, taped or simply moved out of the way. If you remove them, tag them so they can be re-installed in proper order. 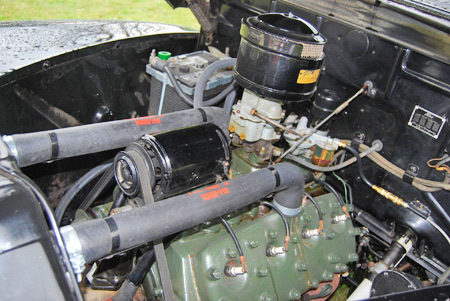 New hoses—especially repro types—help to set off an engine compartment. Use masking tape and newspaper to cover parts you don't want to paint. Always use high-quality masking tape that won't curl, stick or tear apart. Take your time cutting the newspaper to the right size and shape. Used properly, newspaper can save you a lot of tape expenses. It can also be used to wrap, cables and engine accessories so paint doesn't get on them. Special high-temperature engine paints are available, but British car restorer Joe Curto, of Queens, N.Y., insists that regular enamel works just as well and costs less. He may be right. I bought engine paint from one MG supplier for $14 and actually wound up with a can of brand name "Truck and Van" paint that costs $4 at my local Farm & Fleet store. Whether you need special engine enamel may depend on how warm your particular engine gets when it is running. Eastwood advertises that its engine paint is heat resistant to 300 degrees. Selecting the right, authentic color is important to most hobbyists. You can't go by the color of engines in sales catalog illustrations, which are sometimes inaccurate. Some engine paints are named "Ford Blue"or "Chrysler Orange" to help you find the color you need. Eastwood (www.eastwood.com), Bill Hirsch (www.hirshauto.com) and Tower Paint Company (www.towerpaint.com) all have done research on colors used on certain old-car engines. Car clubs are another excellent source of correct engine paint color information. In addition to painting your engine block and cylinder heads the right color, you will want to spray accessories like the starter, generator and air cleaner. Today you can get a wide variety of special paints such as Chassis Black, Carburetor Renew and Engine Builder Gray to restore other under-hood components. Spray colors that duplicate aluminum, magnesium, copper, brass and titanium are available. If you plan to detail the radiator, there is a special "thin" black paint that withstands high temperatures without restricting airflow like thick paints do. Special exhaust manifold paints come in black, silver and gray. If your engine still has its original stickers or decals and they are in good condition, you'll want to try to mask them off so they don't get painted over. In some cases, it is correct to paint over metal tags. In other cases, you can spray them, then take the finish off with acetone. Many vendors sell reproduction engine stickers and decals to give air cleaners and valve covers the "factory" look. Catalogs are available to determine which decals your car should have. When it comes to belts and hoses — as well as service parts such as spark plugs, distributor caps, boils, voltage regulators and oil filters — the best way to make them look new is to install new ones as part of a spring tune-up. However, if such parts are relatively new, you can still clean and detail them. A soft-bristle toothbrush to break up the dirt and a clean rag to wipe it off with do wonders. Spray protectorants can be used to clean wires, plastic windshield washer jugs, brake master cylinders and so on. Spilt flexible wire loom is used to cover the wiring on many modern cars and can be added to older ones. Such coverings are great since they keep field mice from eating through spark plug wires, but they tend to get dirty. You can renew their appearance with liquid shoe polish. A few hours spent detailing your collector car's engine is well worth the time and energy it takes. Engine detailing will make the car more show worthy next spring and could increase its roadworthiness n cases where you add new parts or unearth problems as you go through the detailing routine. And should you decide to sell the car, a nicely-detailed engine can help swing the deal.